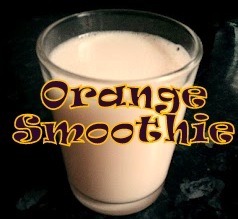 Sticking to my ethos of attempting recipes and making mistakes so that you don't have to, today's "recipe" is Orange Smoothie. Now, bearing in mind that I cleaned the kitchen from top to bottom today and found a blender that I forgot I had, this was just a "chuck in what I think is supposed to go in" attempt at a smoothie. Squeeze the living daylights out of the oranges and extract the juice. 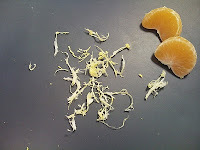 Don't do what I did and just pick all the pith off and throw them in the blender because you don't have a juicer as you'll end up with "issues"*. However, this does give me an opportunity to share this picture with you that hasn't had enough attention over the last two years. 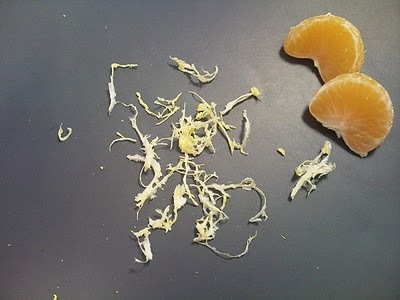 I entitled it "Pith Artist" back in 2010. Put the orange juice/oranges, milk, sugar, vanilla extract, ice cubes/ice cream into the blender. Pour into a glass and drink. ** If you are using a new blender, like me, try to remember where you put the instructions because you'll not be able to work out why the on/off/pulse button doesn't work until you lock the jug into place properly.